Reflections and Ruminations: It makes all the difference when we pray with love, out of love and because of love. It makes all the difference when we pray with love, out of love and because of love. There is a pervading sense in many minds that just because one has said prayers, it means that one has prayed. However, these two actions can in reality be very different and one can really end up having said prayers without praying, in the same way that a spouse can say the words “I love you” without really loving. 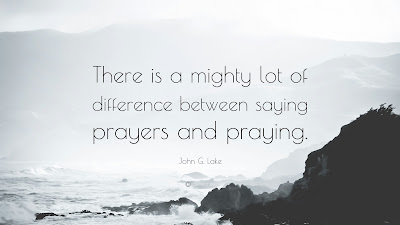 In my experiences of either counselling directees or hearing confessions, I sometimes ask the question “do you pray?” to which the response very often is “I say my prayers daily”. When I say in return that this is not what I asked, I am in no way dismissing their sincerity. I am merely bringing to their attention that there is an intrinsic difference or distinction between the two, and that it is more than just a semantic one. Perhaps more so in the long-standing tradition of the Catholic faith, we have been steeped in the formula of crafted and worded prayer. There is indeed goodness in this. From a very young age, we are taught how to say our prayers, and this has been highly effective in providing us with a framework of how we can approach God and the mystical in a formulated way. Particularly pertinent to a developing mind and psyche of a child who is in the process of growing from a toddler to a young adult many years down the road, being schooled in prayer that has a framework that is specifically formulaic and worded has its merit. But together with, and ingredient to learning prayer in this formulaic way, needs to also be a keen intention in developing a heart that has a love for God. What I have come to notice in my years of ministry is that it is this particular aspect of prayer that is highly underdeveloped and insufficiently imparted either by parents or catechists. It often results in a disconnect later on in life, and there is a price that one pays heavily, often without even knowing it. That we are loved by God is something that we don’t give enough attention to. But I have come to see over and over again in my priesthood that this is the lynchpin that is missing in so many lives that are either becoming slowly shattered or already in smithereens. Our rigorous prayer life that is depicted largely only by saying prayers, whilst good, can only do so much. Because we are often rattling off words learnt by heart, we do not easily give ourselves over to emoting the same words from the heart. We must never underestimate the great power that we are given when we appreciate anew that we are loved by God. Just on the human level, aren’t so much of our lives so positively affected when another human being tells us that in his or her eyes, we are loved? What more the creator of the universe who has ultimate power over everything and everyone? I chanced upon a short dramatized biography of the famed fashion designer and doyen Coco Chanel recently in my convalescence. This fashion doyenne from Paris who was born in the late 1800s had a very deprived childhood and was abandoned at an orphanage by her father whom she always hoped would come back for her one day. He never did. All her life, Coco, whose real name was Gabrielle Bonhuer Chanel, looked for love and approval in her myriad affairs but she never did. There is one poignant scene in a final part of that particular film which saw her speaking to one of her models whom she chose to wear her creations on the catwalk at a fashion show, and she said to her in words to the effect of “remember – the most important thing in the world is to be loved by another. It is not a big deal when we love others. We do that all the time – we love others, and we love things. But when someone loves us, our world changes and becomes beautiful”. There is much truth in this, but as a priest, I would apply this truth ultimately to God, and this takes the truth to the nth degree. What Coco said mirrors what is found in 1 John 4 which tells us "In this is love: not that we have loved God, but that he has loved us and sent us his Son as expiation for our sins". When we become aware and truly convinced that not only we are loved, but that we are loved by God who is the master of the universe who has loved us into being, our world not only becomes beautiful. Our world becomes infinitely brighter and safer because this assurance of divine love gives us the ability to take all the life throws at us. We will be chasing much less the things and relationships and delights that are only good for the moment and whose satisfactions fade almost immediately thereafter, like the way fireworks are breathtaking and disappear seconds after having lit up the night sky. Jesus came to impart this to us, and used his entire life through Calvary to tell us that in him, God was promising us he loved us. Indeed, in Jesus, God gave us his Word. In the spirit of someone who cheers a runner on in a marathon, I wish to affirm the awesome work you are doing through those answers on Catholic News and through this blog. May your words guide many. May God bless you. The right spirit of Lent and its challenges.